I returned to The Artful Vegan this weekend, one of my favourite cookbooks. 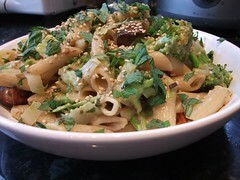 I have made this dish before but didn’t blog it for some reason (maybe the photos were even worse than the one above). This is one of simpler recipes in the book, but the tofu does require some special preparation. In fact, it’s cooked in 3 stages, but ends up with such a fabulous texture and flavour that it is totally worth it. First of all it’s baked in a marinade, then smoked (I use my Cameron’s stovetop smoker), then brushed with a glaze and grilled (broiled). The finished product is a smoky chewy bite chock full of umami which contrasts perfectly with the rest of the ingredients. After the tofu is made (and you can do it all in advance), the rest is plain sailing. A fairly straightforward chinese leaf and carrot salad, a handful of sprouts and a creamy wasabi dressing. The dressing is a revelation by the way – a beautiful creamy texture without cream, nuts or any other obvious creamy element. 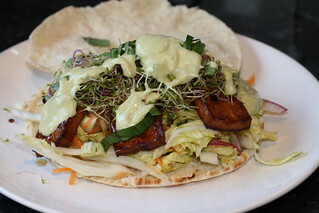 The result is a beautiful dish – tasty yet very light, with the tofu being the absolute star of the show. This was another recipe from the wonderful “Artful Vegan”. If you’ve been reading long you will know how much I love both of the Eric Tucker books, so when we were wondering what to eat over the Bank Holiday I thought of this. It’s pretty simple by Eric Tucker’s standards, but like all of his dishes has a very good depth of flavour and just a little something extra going on. The recipe starts with Eric’s own method of baking and smoking tofu which is one of my favourite ways to eat tofu anyway, so that was always going to be a good start. I used my trusty Cameron’s smoker (beware picture of dead fish in it!) – I’ve never bought a piece of smoked tofu since I got the smoker and hopefully never will again. But if you are foolish enough not to own a food smoker, you could use bought smoked tofu for this dish and still be successful. Once you’ve done the tofu, the dish comes together very quickly. The sauce is simply blended together (I used double the amount of chilli) and the rest is a very simple set of ingredients. I can sometimes get Thai basil but I couldn’t on this occasion so I used a pretty good substitute of finely chopped mint and basil. The finished dish was a delight – the sauce was zingy from all the lime but nice and rich from the peanut butter and coconut milk. If you are not such carb fiends as us you may prefer to have a higher ratio of vegetables to pasta but we loved it exactly as it was!